Located in the private Golf Residential of Parque del Sol in Santa Ana, this is a prestigious home with a sophisticated architectural design. Built with high end accessories throughout and featuring 5 bedrooms, an office and Den, 5 full bathrooms and a guest bathroom, an ample living room opening out to a big covered patio in front of the pool and full maid’s quarters. With a fantastic view of the 18 holes golf course and the beautiful mountains of Santa Ana this great house is located on a property of 1,200 square meters / 12,900 square feet. 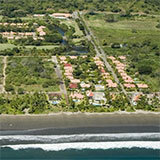 Contact our ofice in Costa Rica today!